Lawns are happy when microbial biomass is around 400ugC/gm soil while gardens do best at about 600ugC/gm. Plants make their own food, but the minerals a plant needs, nitrogen, phosphorus and potassium etc. must be provided and they are naturally provided by the microbes in the soil. Bacteria, the smallest microbes and the bottom of the soil food web, are rich in minerals which they mine from the soil. These bacteria are food for larger microbes called protists and when these bacteria are eaten by the protists much of the minerals are released to the plant. The most amazing thing is that a plant will this all by providing food for the bacteria. With increased food the bacteria multiply; they are single celled so they don’t get larger with more food, they divide into two and they can do this as rapidly as every 20 minutes. As the number of bacteria increase the number of protists that graze on the bacteria increase and the spilled nutrient supply increases. If soil has a healthy microbial population plants are protected naturally. A plant drips up to half the energy it makes and sends to the roots and the microbes. These microbes do more than provide minerals; they protect the plant and the soil from pathogens, in the same way that a healthy microbiome in your body protects you from pathogens. 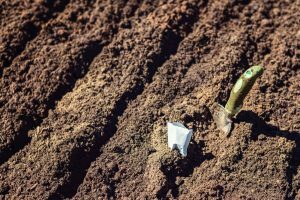 Soil microbes develop antibiotics to fight off pathogens, because these pathogens threaten the livelihood of the microbe – all the antibiotics we use are based on soil microbial antibiotics. Amazingly, scientists have shown plants actually control the kind of microbe around the root: when a pathogen is present the plant can put out the favorite snack of a microbe that fights that pathogen. So if plants have a healthy microbial population they are protected naturally and unlike pesticides which can kill indiscriminately, the plant and its microbial army are targeting pathogens. One big answer for low microbes is lack of microbial food. Like almost all living things, the dry weight of a bacterium is largely carbon and the carbon that bacteria need comes from plant material. Bacteria can get their minerals from the soil, but they get the carbon they need from plant material or from plant material that has been processed by an animal, i.e. animal waste. Harvesting a crop or removing the dried material from the garden, causes a food shortage for the microbes. Compost made from food waste and these dead plant materials is exactly the food that these microbes need. If there is extra microbial food it is saved as humus and banked in the soil. The decayed bodies of microbes are stored in humus as molecules containing carbon, nitrogen, phosphorus, potassium, etc. and since all this material originally came from plants it contains all the nutrients that plants need in the right ratios. The added bonus is the soil contains twice as much carbon as the air (air contains C as carbon dioxide). Anything that inhibits plant health also inhibits the microbial population. For most plants pH levels below 5.5 and above 8 are harmful and all the nutrients in the world won’t correct this, only a corrected pH level will solve the problem. Compacted soil has low microbes because microbes need oxygen and space to move as do plants. If there are no plants, there will be no microbes because microbes need plants as much as plants need microbes. Toxins or pathogens will inhibit microbes and plants. If you have a space where a plant has died, test it for microbes before planting again, if microbes are lower than the area around it do not plant again until the condition is corrected. Even though microbes only give plants minerals, like nitrogen, simply supplying the minerals is not the right solution. Firstly, microbes supply many micronutrients that the plant requires and the micronutrient requirements of plants are very plant specific. The plant also has special foods it uses to lure the microbes that have these nutrients to the root area of the plant. Second, microbes are tightly stuck to the soil and they are there when the plant decides that it needs the nutrient, where chemical mineral applications can wash away. Third, the amounts of chemical fertilizer that need to be applied kill the microbes in the soil. When the microbes are gone, the plant is susceptible to disease, the plant requires twice as much water, erosion can increase, and carbon is not being stored in the soil. Microbes are stuck tightly to soil particles, so that they don’t wash away. The glue that microbes use to attach themselves also causes soil particles to stick to one another giving soil its structure. In the absence of these glues, soil erodes, it becomes dusty and blows and washes away. The good news is that soil scientists have shown that increasing microbial biomass can regenerate the soil: e.g. cover crops make food for microbes which increases soil quality and can even supplement crop mineral deficiencies by e.g. supplying nitrogen requirements. Soil with a healthy microbial population requires 50% less irrigation. The aggregated structure of soil that contains a healthy microbial population allows the soil to retain adequate moisture while providing adequate drainage. Plants are more resilient when they are supported by a healthy microbial population. Feed your microbes organically, using compost or organic supplements. Read Teaming with Nutrients by Jeff Lowenfels for lots of good recipes. Check your microbes 1-2 weeks after the feeding, if you didn’t get a good response, try another plant food. Plant a cover crop to help replace nutrients, i.e. green fertilizing, over the winter. You can check out which cover crop is best for you by growing several varieties in pots and testing for microbial load in a month. The cover that has the highest number of microbes is the best complement for your soil, i.e. it is best at replacing the limiting growth factor in your soil. Use only light tilling practices as heavy tilling disrupts the fungi. If you need to kill a cover crop or weeds, place a black plastic sheet over the cover crop for 2 weeks just as sun warms the earth and the material under the plastic will die. Rotate the plants. Different plants take different nutrients from the soil and so the same plant will deplete the soil over time. Also plant pathogens can accumulate and by rotating the residual pathogen should not bother the new plant. Monitor your plant. The microbial biomass in the soil around a plant that is healthy should not vary more than 25% . If you see a big drop, you need to step in, e.g. trees can be helped by fertilizing with compost or compost teas and fungal amendments. Make sure to remove a diseased plant before the disease can spread. Judith Fitzpatrick, Ph.D. is the president Prolific Earth Sciences. She can be contacted at 201.543.7109 and you can visit here website at Microbiometer.com.